London, UK – 04 October 2018: Following today’s statements from the NCSC regarding Russian state involvement in a number of cyber-attacks between 2015 and 2017, IP EXPO Europe concluded with a strong focus on cyber security and privacy. Author and digital privacy commentator Andrew Keen kicked-off the second day of the two day event with a focus on the digital revolution, addressing how it’s created a surveillance style economy and what we need to do to realise the positive of the revolution instead. Whilst Keen focused on privacy within the digital revolution, several speakers across the final day of the conference turned the audience’s attention towards organisational security, a more direct response to the Russian cyber-attacks. Derek Buchanan and Kirsty Kelly from Mimecast dug into how combining human and cyber threat intelligence can benefit security analysis; David Warburton from F5 Networks gave attendees advice on how to prepare for IoT attacks; and Samantha Humphries from Rapid7 shared details on the different tools and techniques hackers use to gain access to an organisation and its sensitive data. 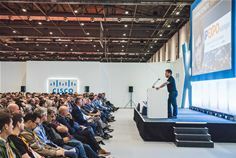 IP EXPO Europe will return next year as part of Digital Transformation EXPO on 9 – 10 October 2019 at ExCeL London. We look forward to seeing you there. For more information, please visit www.ipexpoeurope.com, or get involved on Twitter following @IPEXPO. IP EXPO Europe co-located at Digital Transformation EXPO is Europe’s number one enterprise IT event. With six top IT events under ONE roof, 300+ exhibitors and 300+ free to attend seminar sessions, IP EXPO Europe is the must-attend IT event of the year for CIOs, heads of IT, security specialists, heads of insight and tech experts. The event showcases brand new exclusive content and senior level insights from across the industry, as well as unveiling the latest developments in IT. IP EXPO Europe now incorporates IP EXPO, Cyber Security X, Developer X, AI-Analytics X, Internet of Things X and Blockchain X.